1. Use locally available junk, supplemented by locally available low cost parts, to build a small scale prototype charcoal retort using commonly available hand tools and welding. 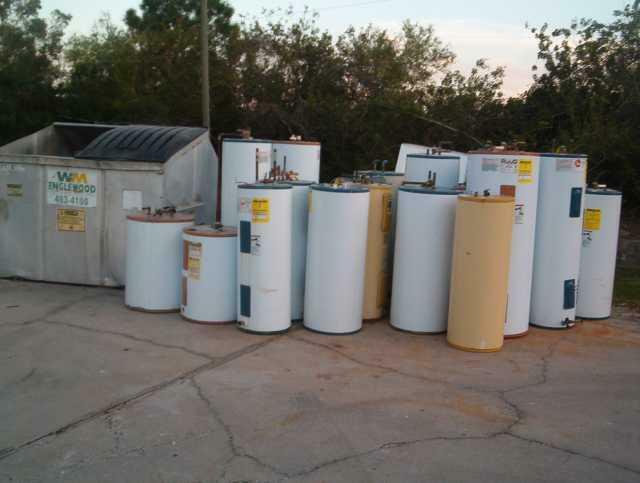 Water Heater Tank - Charcoal Retort: Free junked water heaters outside a local plumbing contractor's shop. Water Heater Tank - Charcoal Retort: Converted water heater retort loaded with feedstock and fuel, ready to fire. The firebox grate size is 15" x 15" x 9", minus some space occupied by three off-gas/volatiles afterburners. The top of the stack is instrumented with a thermocouple and thermocouple reading multimeter. 2. 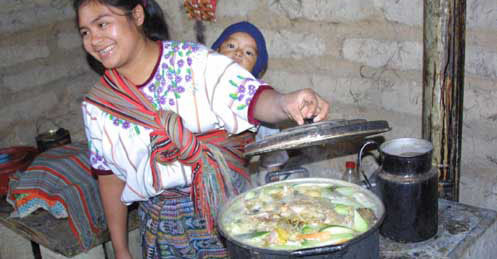 Use locally available waste biomass for both feedstocks and process fuel. The desired products are a) metallurgical grade char to fuel small iron melting cupola furnaces and non-ferrous metal charcoal crucible furnaces and b) consistent char and torrefied wood fuels for small biomass gasifiers. 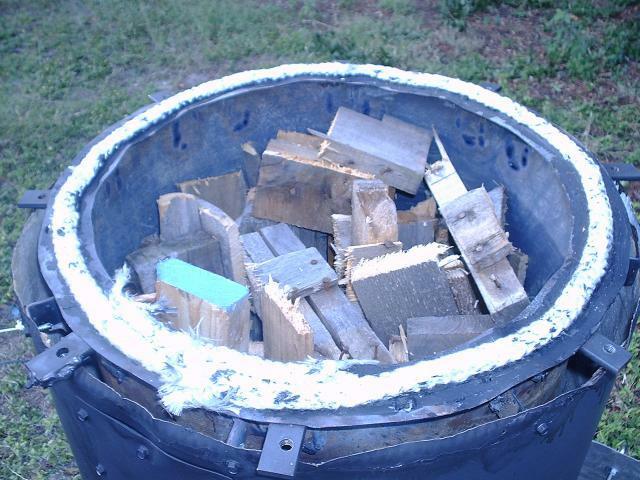 Water Heater Tank - Charcoal Retort: Scrap hardwood pallets. 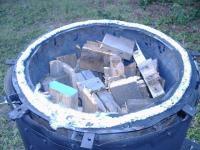 Water Heater Tank - Charcoal Retort: The feedstock: chainsaw cut pieces of scrap pallets. 3. Achieve adequate retort operating temperatures for 100% feedstock conversion to *metallurgical* grade char to fuel small iron melting cupola furnaces and non-ferrous metal charcoal crucible furnaces. 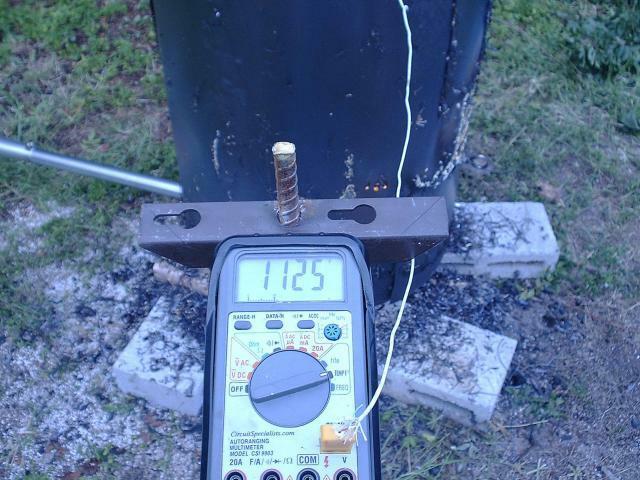 Water Heater Tank - Charcoal Retort: Thermocouple reading. 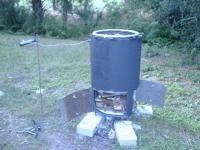 Highest upper stack temperature measured was 1167F. 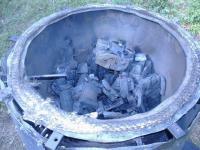 Water Heater Tank - Charcoal Retort: The charcoal product. A brown dust residue coats some of the char pieces, the retort tank sides, the gasket seal and also the inside of the lid (not shown). 4. Recycle and incinerate all by-product retort off-gasses and volatiles. The purposes are to reduce biomass fuel requirements and also eliminate any by-product disposal problem. i.e. "minimum environmental footprint". Water Heater Tank - Charcoal Retort: Retort afterburners firing off-gasses and volatiles generated during exothermic carbonization, and heating beyond exothermic carbonization. The current retort prototype is based on a salvaged 40 gallon electric water heater tank. The retort interior measures 20" diameter by 24" tall. 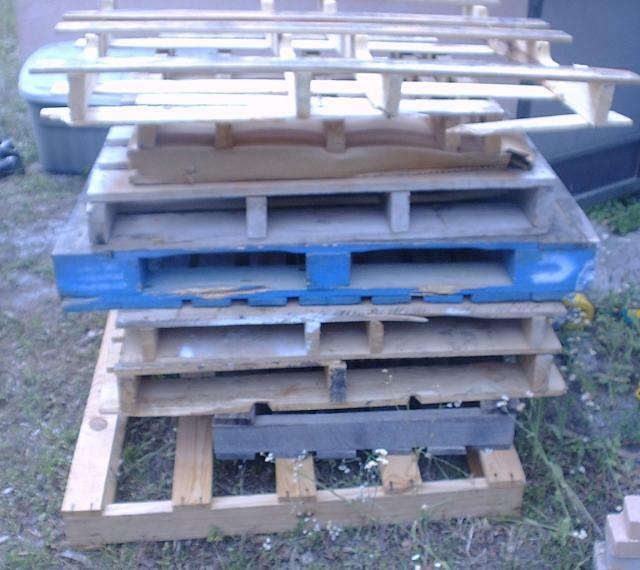 Primary materials used were a junked water heater, sheet metal from a second water heater, sheet metal from a junked washing machine, concrete reinforcing bar ("rebar") and assorted small hardware and pipe fittings. Primary tools used were a wirefeed MiG welder, a 7" circular saw with abrasive cut-off blades, jigsaw with metal cutting blades, a 3/8" VSR drill, a bench-mounted 6" vise and assorted handtools. A drill press was also used for personal convenience, but is not mandatory for successful fabrication. Initial testing was successful for proof of concept and retort design. The current prototype is the second, following an earlier and much less successful water heater based retort design. 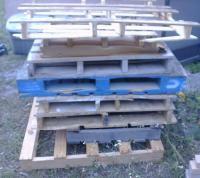 Palletwood feedstock conversion to char was 100%. The product is extremely friable, more so than lower temperature high volatiles char (675F) produced by the earlier less successful prototype. Fixed carbon content testing of the product is planned in the near future. Product samples are being preserved from each test run. No noxious volatiles smells were detected during or after firing, unlike previous testing of a previous retort design. Nor were any heavy tarry volatiles deposits left on the retort surfaces or afterburners. Total wood fuel consumption to reach 1167 F was one firebox fueling. 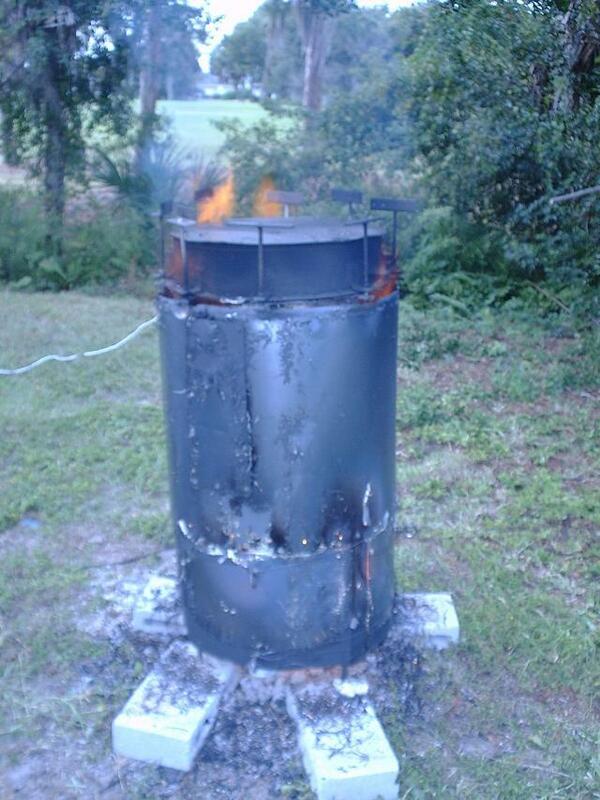 The grate area & firebox size is 15" x 15" x 9", minus space occupied by the retort afterburners. Current status. The retort has been recovered to the workshop for application of mechanical operating improvements initial testing showed are desirable. Testing is planned to resume in a few days.